More and more it seems like the occasionally hard-to-crack walls of New York City are welcoming sounds of the south and the west – and of the latter, not just the Hollywood based kind – into beloved venues around Manhattan and Brooklyn. Many manners of country, folk, bluegrass, and southern rock bands are becoming talking points of the town. 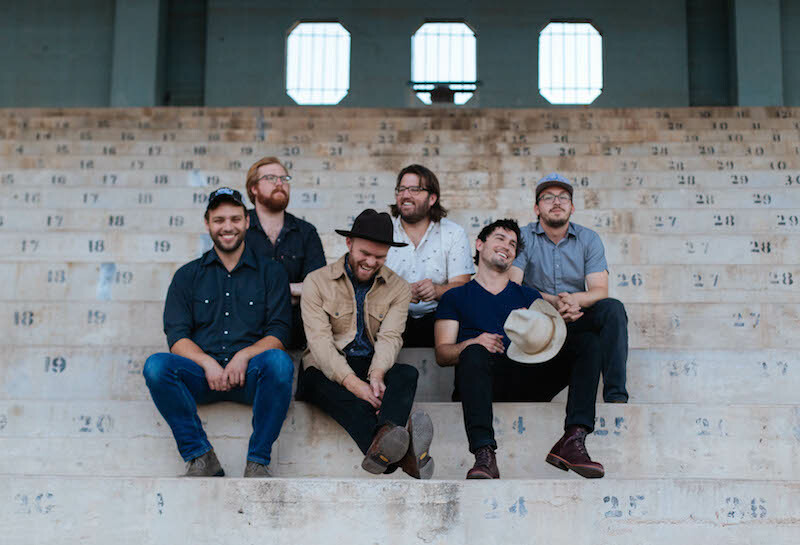 The latest to run with this increasing stream of New England intrigue are the gentlemen of Jared & The Mill – self-described “western indie rockers” presently trekking around the U.S. on a tour that has taken them far from their Phoenix, Arizona roots and will soon bring them to the Mercury Lounge. To their credit, Jared & The Mill are not making their first visit to the island of Manhattan. Just a little over a year ago now, the six man, southwestern band was gracing the stage of East Village arts staple, Joe’s Pub (at the Public Theater), with Alpha Rev, which couldn’t be more fitting as a recently preceding appearance, since Joe’s Pub is known for its “genre-blind” programming. Now just a single week out from their arrival, Kolesar and his bandmates discuss everything but the proverbial kitchen sink. Read on for thoughts on the assembly Orme Dugas – everything from name to track placement, – envisioning the band in a contrasting reality, their plan to break through the hard shell of New York music fans, the magic of finding tour mates in Edison, and even a little lore of the Mill! Kira: First off, many congratulations on your new EP, Orme Dugas! The music really offers a deep well of things worth listening to – from the contrapuntal-esque dance between guitar and banjo melodies, to the hard-hitting downbeats driven hooks, and definitely the sensory-fueled, experience-laden lyrics. In doing a bit of personal research, the words of the EP’s title revealed themselves to reference two real-life things: a central Arizona college preparatory, co-ed, boarding school, and a long stretch of rocky, Arizona road, respectively. Given that Jared & The Mill does hold its life experiences and its home state close to its music, how relevant, if at all, are these things to your reason for choosing this title? Larry Gast III: Well I’m unfamiliar with the two schools but the stretch of rocky road is definitely the name sake for the EP. When the name Orme Dugas was thrown out by Michael as a potential name, it all resonated with us. It’s an unassuming exit on the I-17 as you head north through the Verde Valley towards Flagstaff, and a place that we all love to camp. I also dig the fact that it serves as a little easter egg to our Arizona family that already knows of the spot and also a little invitation to listeners from other states to do a little googling and learn something extra about our home state. Kira: The narratives and associated emotions of the tracks play out in somewhat of an undulating roller coaster fashion. What kind of flow were the band’s emotions in over the course of recording? How, if at all, did the choice of emotional order for the EP’s tracks align with the ways emotions played out while making the EP? Gast III: I feel that as a band we are starting to feel more confident and have more faith in our stylistic and artistic decisions. Our producer Ryan Hewitt really encouraged us to make daring choices and I felt like that set the tone for the session. There was a very upbeat and supportive mood between the band members that made it a really fun record to make and I feel like that energy was captured on this one. When it comes to the track order we always try to organize the songs into a linear narrative. We like to tell a little story that the listener might not overtly hear but leaves the impression that they have completed a journey. It can be tough because these songs come from different writers within the band but our lives have all fallen into such a sync that the experiences tend to compliment each other. Kira: Clearly touring is an integral part of what makes Jared & The Mill the way it is but not every band – even bands with success comparable to yours – decides on the “highly nomadic method,” if you will. How do you think the band’s spirit and the band’s music would have turned out and shone through if Jared & The Mill were a more stationary group? Jared Kolesar: That’s a hard question to answer because the circumstances life offers the artist are what determine the art. I think there’s a chance our music would be a bit more positive in the overtones. Not that our songs are necessarily sad, there’s just more about missing people and things back home. We’re fortunate that we have the freedom to enjoy the crazy lifestyle that is touring, but I think there’s a lot more comfort in the happiness of being around loved and familiarity at home and think our music would reflect that. Kira: Orme Dugas definitely solidifies the band’s further transition to a more “western sound.” All the respect in the world for where you are from, what made the decision to go this route with the music feel like the right choice, as opposed to perhaps, keeping the music more easily approachable? Does or did, fear of self-induced pigeon-holing come up at all? Kolesar: I don’t think we ever were terribly worried about pigeon-holing ourselves, we just play the music that we love to play. I think what guided us to this more western and in our case “natural” sound was the connection we felt to the old western outlaw country artists through the touring lifestyle. A lot of Waylon Jennings, or Merle Haggard tunes tend to be about the same kind of emotions we feel when we’re out on the road. And I think the feeling of connection is what gave us an interest in the music these different artists played. I think we’re also drawn to western music because it sounds like home to us, we all love the desert and the mountains and high plains of Arizona, and the missing of home pulled more western influence out of us, it made us feel a deeper connection to where were from. Kira: The U.S. being as vast a country as it is, there are plenty of people who can probably say they haven’t visited as many state grounds as you all have over the course of your time as a group. Touring might not be new to Jared & The Mill but each round of traveling surely brings new perspective and objectives. That said, what would you say sits at the front of your mind as the band sets out to do something that is at once wholly familiar but with the completion of Orme Dugas, also entirely new? Michael Carter: It’s true that you repeat a lot of the same cities, and even venues, but I think we keep it exciting by having new things to play and new ways to perform them. Obviously with the completion of Orme Dugas we have a whole new list of songs to play, and have to be more selective with which tunes we want to play from our older albums. It’s fun to build a new set list and figure out a way to excite fans who have seen us before. So yeah, I think the thing at the front of our mind when we set off for a tour is mostly how pumped we are to play for crowds again and show them something new. Being at home is good, you get to write, decompress, etc, but you find yourself missing the intention you feel when you’re traveling state to state playing almost every night. Kira: Speaking of familiar things, it’s almost scary how kindred the themes and emotions of your new EP and that of your current tour mates, Edison, are – not to mention the fact that as far as day-to-day life goes, it almost sounds like the two bands were living parallel lives: crossing state line after state line in a van; working hard but always putting the money back toward to evolution of the band; the group’s relationship growing from bandmates to ‘like family’, and, of course, finding inspiration for music in what you see and experiences on the road. Still in all, when a person hears your sets back to back on this tour, the songs are going to bear the souls vastly different people. What are most looking forward to from sharing such a long and widespread journey with Edison? Musical insight? New tips for surviving long, multi-hour drives? Crazy tour antics that will become immortal stories? All of the above? Carter: I would say all of the above. To be specific though I think the two coolest part about touring with a band are bonding over this sort of shared suffering and seeing crowds get pumped on their music. Maybe suffering is to strong a word cause it’s truly very enjoyable and rewarding, but it’s just fun to be with a group of people who understand your lifestyle, the good and bad of being on the road, being fellow road dogs. Sharing crowds, that’s a rewarding part I’ve noticed a lot lately. When we’ve gone out and supported a band we really love and their fans get turned on by our music, or when we’ve had a band open for us and seen our fans embrace them and love them, I dunno, it’s just really cool. Seeing a fan that’s been at your show in the past talking with an opening band your touring with and buying their CD, it’s a neat feeling, and vise versa when a fan of a band you’re opening for and really love approaches us and loves on our music. We’ve already experienced that crossover with Edison and it’s been a blast. Kira: This won’t be the band’s first time to New York but knowing the fast paced, always changing life of the city, how do you guys plan to break the sometimes thick ice around residents who will see you at Mercury Lounge on 1 September with just the one night to both make and leave an impression with a house of new faces? Josh Morin: Every performance has a unique audience, and honestly that’s what makes our job so fun. I think when we encounter an audience like you are referring to, we try to literally engage with them. Ask them a question, tell them a joke, give them a hard time, or just get them yelling something silly (a Jared specialty). Often times we will get side tracked in some stage banter on accident and make ourselves look like a bunch of fools. I think it re-humanizes us from just being a band that is gonna get through their set list and get on with the night. You paid money to be there, we are gonna do everything we can to make sure you engage and have a good time. Morin: Actually… It is part of the band lore that we can not all eat crepes together, it is the signal and beginning of us breaking up if we do. Nothing against crepes, in fact I would say we are all big fans! I would speculate every band has some sort of lore and mythology that they invent as they travel and meet all sorts of different people, we’re no different. Personally, I’m very fond of the sweet crepe, particularly with Nutella, strawberries, and banana. Pretty plain Jane, but damn if it doesn’t do the trick. I once had a machaca crepe that was a dope savory variation! Kira: The band’s music boasts plenty of fundamental talent and heart but it’s certainly not absent a little amped up bite. That in mind, this bit of curiosity comes mostly from the techie-minded side of things but can often be as intriguing and revealing as chatting about any one song lyric: What is/are your favorite tools of the instrument trade? Favorite effects, guitars pedals, drum sticks, type of picks, etc.? Why? Chuck Morriss III: Generally, as a band, we are not picky when it comes to gear, and don’t subscribe religiously to many brands. We like to play what sounds good, and use equipment that can take a beating without feeling too guilty about it. Larry and I tend to gravitate towards the clean, versatile sounds that can be driven and molded from tune to tune. Larry has carved out a really great telecaster sound that’s equal parts Mark Knopfler, Ry Cooder, and Johnny Greenwood. I’ve been using this wonky little P-bass when I’m on tour for the extra growl, and like to use this awesome hollow body bass made by Allred Guitars in Phoenix for some recording. I also like throw in a little guittaron to our sets, which is a large bodied mariachi instrument. Jared and Michael do a great job of blending really excellent acoustic guitar and banjo tones into the music, and there is no secret to that; just good instruments, a small preamp, and straight to the board. During most of our sets we like to play a few tunes entirely acoustic in the crowd. When we do that, Josh plays a washboard with shotgun shells on his fingers, and that never fails to get a reaction. Josh is also known for employing a veritable arsenal of percussion instruments on stage, and always keeps them guessing. Orme Dugas will be independently released on 9 September 2016. Pre-orders are available now through iTunes. Jared & The Mill comes to New York City on Wednesday, 1 September. See below for full tour list and ticket links.